The shoulder joint is the most mobile in the body. It acts together with the shoulder girdle to allow the arm to move in different directions: forwards, backwards, sideways, upwards and into rotation inwards and outwards. Unlike most other joints, the shoulder has only quite weak ligaments. It depends on its capsule, surrounding muscles and tendons for stability. This gives the shoulder great freedom of movement, but makes it vulnerable to injury. The shoulder is a ball-and-socket joint. Technically it’s called the glenohumeral joint and is classified as multiaxial spheroidal. It’s formed between the rounded top or head of the arm-bone (humerus), which forms the ball of the structure, and a flattened area called the glenoid fossa on the outer side of the shoulder blade (scapula), which provides a kind of socket, deepened by a fibrous rim called the glenoid labrum. The joint is very loosely formed, as the head of the humerus is bigger than the glenoid fossa. It has a fluid-lined capsule which encloses the head of the arm-bone, and is attached to the fibrous rim (glenoid labrum) of the glenoid fossa. The capsule is lined by a fluid-producing synovial membrane. Its inner side is attached to the edge of the shoulder blade, including the tip of the coracoid process, which means the long head of biceps lies within the joint. The outer side of the capsule is fixed round the arm-bone, just below its rounded end. At the front of the shoulder, the capsule is reinforced by the three glenohumeral ligaments. The coracohumeral ligament joins the outer part of the coracoid process to the arm-bone. There is also the transverse humeral ligament which lies at the front of the arm-bone and helps to hold the long head of biceps tendon in place. Where soft tissues like ligaments and tendons cross over each other or lie close together, bursae, or fluid-filled sacs separate them from each other and provide friction-free movement between them. The subacromial bursa which lies between the deltoid muscle and the joint capsule is probably the most important in terms of injury. Stability in the shoulder is provided mainly through the tendons and muscles which surround the joint. Because the shoulder is so mobile and its ligaments relatively weak, it’s vital to maintain good balance and function in all the muscles acting on the joint. The supraspinatus tendon supports the joint from above, the long head of triceps from below. In front lies the subscapularis muscle, while behind are infraspinatus and teres minor. The long tendon of the biceps muscle lies inside the joint. Covering the whole shoulder is the deltoid muscle, which creates the joint’s soft rounded contour. The deltoid muscle consists of three parts. The middle fibres lie over the top of the shoulder, and lift the arm sideways against gravity, with some help from supraspinatus. This is the concentric action of these muscles, while the reverse movement, done with control to counteract the downward effect of gravity, is the eccentric action. Over the front of the shoulder are deltoid’s anterior fibres, which bring the arm forwards and up into flexion, in conjunction with pectoralis major and coracobrachialis, with some help from biceps. It’s mainly pectoralis major which initiates this movement when the arm is brought forwards from behind the body. Pectoralis major and the anterior fibres of deltoid are also active in turning the arm inwards into medial rotation, together with latissimus dorsi and teres major. When your arm is by the side of your body, subscapularis joins in to turn the arm inwards. 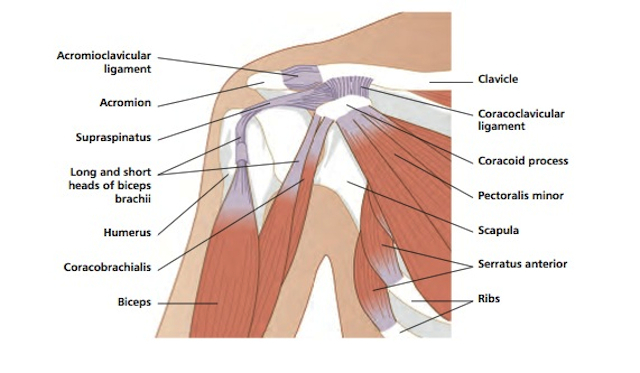 The posterior fibres of deltoid behind the shoulder act to take the arm backwards, together with teres major. When the arm is held forwards and then forcibly drawn down and back, latissimus dorsi and pectoralis major are involved in the first part of the movement, until the arm reaches the vertical position. Deltoid’s posterior fibres also turn the arm outwards into lateral rotation, together with infraspinatus and teres minor. Because the shoulder is so loose and unstable, during normal movements certain muscles act to stabilize the head of the arm-bone, keeping the joint in correct alignment. These are subscapularis, supraspinatus, infraspinatus and teres minor, short muscles which lie close to the joint, and which are known collectively as the “rotator cuff”. They reinforce and blend with the joint capsule, and stabilize the head of the arm-bone whenever the arm is lifted sideways. Supraspinatus helps to hold the arm-bone in place when the arm is held down by one’s side, counteracting the downward pressure of gravity. Biceps brachii is the most prominent muscle on the front of the upper arm. It’s a two-headed muscle which acts over both the shoulder and the elbow . Incidentally, biceps means “two-headed”, and it’s incorrect to remove the “s” to try to make a singular called “bicep”! At its upper end the short head of biceps is attached to the coracoid process, a piece of bone jutting out at the front of the shoulder blade. The long head lies within the shoulder joint itself, and is attached just above the glenoid cavity, the part of the shoulder blade which receives the head of the arm-bone. At its lower end, biceps is attached to the radius, the outer arm-bone, with a further attachment to the back of the inner arm-bone, the ulna, both just below the elbow. The main concentric action of biceps is to turn the forearm outwards into supination, so the palm of the hand faces the ceiling, against the influence of gravity or a resistance. It also bends (flexes) the elbow, helps to bring the arm forwards at the shoulder (again into flexion), and helps to keep the head of the arm-bone steady when the deltoid muscle is contracting to lift the arm upwards. It controls the reverse of all these movements with eccentric action. Coracobrachialis starts from the coracoid process, a knob of bone jutting forward from the upper outer part of the shoulder blade (scapula). It’s close to the short head of biceps, and in part attached to it. It passes down beside the biceps and brachialis muscles to its lower attachment on the inner side of the arm-bone. Its concentric action is to bring the arm forwards and across the body against gravity or a resistance, controlling the reverse movement with eccentric action. Coracobrachialis helps the anterior fibres of the deltoid muscle to hold the shoulder in place when the arm is lifted away from the body sideways (into abduction). Brachialis lies under biceps and is attached to the front of the arm-bone. At its lower end the muscle forms a tendon which is fixed to the upper part of the ulna (inner forearm-bone). It acts concentrically to bend (flex) the elbow against gravity or a resistance, and eccentrically to control the reverse movement when the elbow straightens out (extends) in the direction of gravity or a load. Triceps brachii has three heads, and forms the main bulk of muscle on the back of the upper arm. As with biceps, the name cannot be formed into a singular by removing the “s”, so the term “tricep” is incorrect. The long head of triceps starts from the side of the shoulder-blade, just below the glenoid fossa, while the lateral and medial heads arise from the back of the arm-bone. The lower end of triceps forms a tendon which is attached mainly to the olecranon, the top part of the ulna (inner forearm-bone). The long head of triceps acts on the shoulder joint, helping to support the lower part of the joint capsule, especially when the arm is lifted up. It can also help to bring the arm backwards from the forward position, drawing it in towards the body (into adduction). Triceps acts concentrically to straighten the elbow against gravity or a resistance, controlling the reverse movement with eccentric action.